Albert Bierstadt loved to paint majestic views such as can be found in our national parks. Albert Bierstadt was a German who immigrated to America. Bierstadt’s painting, Among the Sierra Nevada, is 120 X 72 inches. The Sierra Nevada is a mountain range, most of which is located in California. Bierstadt’s paintings were popular because people in the eastern United States were fascinated by the western frontier. Prints from his paintings are still popular today. Bierstadt's paintings helped create an appreciation for America's natural beauty and a desire to preserve it, which led to the creation of national parks. A lake is even named after Bierstadt which is located in what is now Rocky Mountain National Park. Bierstadt was brought to the area in 1876 by a wealthy Irish aristocrat to produce a painting for a castle in Wales. Rocky Mountain National Park has 265,000 acres in Colorado. The park has some of the most spectacular scenery in the world with 60 mountain peaks above 12,000 feet. Rocky Mountain National Park also has 147 lakes, roughly 450 miles of streams, and several small glaciers and permanent snowfields that can be found in the high mountains. Bierstadt completed over 500 paintings during his lifetime. Bierstadt was considered part of the Hudson River School in New York. 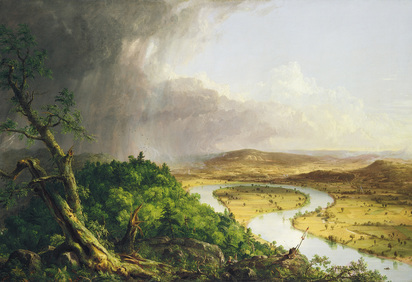 The Hudson River School was a group of landscape artists who started painting along that scenic river in New York. Their style of painting celebrated the American wilderness with detailed, realistic, and sometimes idealized paintings. This Hetch Hetchy Valley scene in Yosemite painted by Bierstadt is now under water from a dam that was built in 1923. This Bierstadt painting depicts Cathedral Rock in Yosemite National Park. Bierstadt traveled to the region of Yellowstone in 1871. Bierstadt made several drawings of the geysers in Yellowstone. Approximately half of the world's geysers are found in Yellowstone. Old Faithful is the most famous geyser in Yellowstone, but the park contains many more such as this one, Riverside Geyser. There are more than 10,000 hot springs and geysers in Yellowstone National Park. ​His art of the region influenced the U.S. Congress to set aside Yellowstone as a park in 1872, making it the first national park in the world. ​The Rocky Mountain, Lander’s Peak, which he completed in 1863, sold for $25,000 in 1865. In Bierstadt’s later years, his work fell out of favor as being too romantic or theatrical. During the 1960’s, interest in his work was renewed and his paintings are still appreciated today. Because of Bierstadt's interest in painting the landforms of the American West, a mountain, Mount Bierstadt, and a Lake, Bierstadt Lake in Colorado were named in his honor. In 1998, a U.S. postage stamp featured his painting, The Last of the Buffalo. Another stamp was issued in 2008 of his painting Valley of the Yosemite. "Albert Bierstadt Biography".Albertbierstadt.org. N. p., 2016. Web. 18 Aug. 2016. "Albert Bierstadt: Landscapes Of The American West | Wyohistory.Org".Wyohistory.org. N. p., 2016. Web. 17 Aug. 2016. "Albert Bierstadt". Wikipedia. N. p., 2016. Web. 18 Aug. 2016. Centerofthewest.org. N. p., 2016. Web. 17 Aug. 2016.